North-West University FM (NWU FM) radio presenter and master’s student in Setswana, Onalenna Leburu, was announced the best Kwaito radio personality at the Mzansi Kwaito and House Music Awards on 24 November 2018 at Carnival City. Onalenna is the host of the show “Dintshang – Church ya Mapantsola” which plays only Kwaito music. The show gives local, upcoming Kwaito artists and DJs the platform to showcase their talent live on air. She has interviewed prominent Kwaito artists such as the likes of Jakarumba, the late Tsekeleke, Mavusana, Crazy T (Alaska), Letso & Rio Dee (Botswana) and Dj Fisha Fasha, just to mention few. 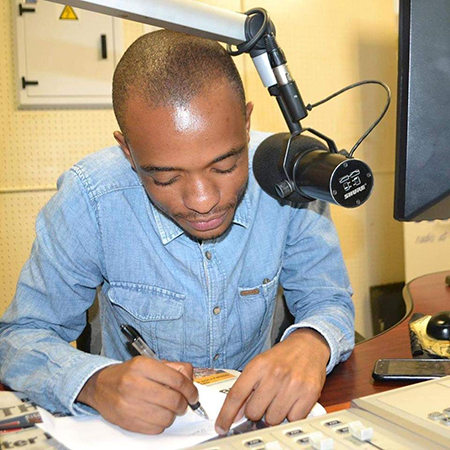 The talented radio presenter who makes Setswana fashionable recently had an opportunity to co-host Nna Le Wena with Amon Mokoena on Motsweding FM. Onalenna was nominated alongside other radio personalities including Nkiyase & Tshepo from Alex FM, DJ Mgedeza from Massiv Metro, and Mark from Eldos FM. The Mzansi Kwaito & House Music Awards is about recognising, celebrating and connecting Kwaito and House artists and those who are constantly working hard behind closed doors to craft great music that we only receive as a final product.